Spanish version of a 5x7 print with heart created by Raphaella Vaisseau. 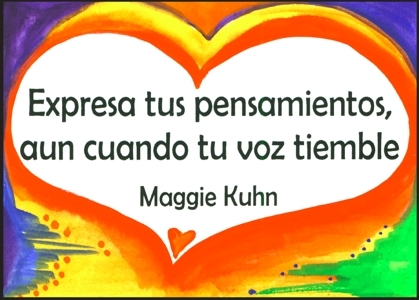 Maggie Kuhn inspires us to "Speak your mind even if your voice shakes." She did just that as the iconoclastic founder of the Gray Panthers. According to their website, graypanthers.org, in August of 1970, Maggie Kuhn convened a group of five friends, all of whom were retiring from national religious and social work organizations. This first "Network" of friends gathered to look at the common problems faced by retirees � loss of income, loss of contact with associates and loss of one of our society's most distinguishing social roles, one's job. They also discovered a new kind of freedom in their retirement � the freedom to speak personally and passionately about what they believed in, such as their collective opposition to the Vietnam War. This 5x7 poster of Maggie Kuhn's famous quote is ready to mail as an motivational present for your favorite activist of any age. Speak up. Be courageous. Your voice is important. What you say can change the world.